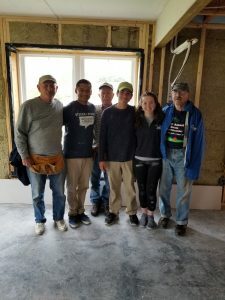 Middlebury students (from left) Shougat Barua, Omar Valencia, and Juliana Dunn join community members on a Habitat for Humanity build. A partner of the Addison County Habitat for Humanity chapter, the college’s Habitat affiliate seeks to address the need of simple, decent, affordable housing by working on local building sites, fundraising for the local Addison County chapter, assisting the chapter in its publicity and fundraising events, educating peers at Middlebury about the need for affordable housing around the world, and more. If you’re interested in learning more about the organization, please click here. This week’s Student Leader Spotlight is Omar Valencia, the president and weekend build organizer of the college’s Habitat for Humanity affiliate. Why should folks join Habitat for Humanity? What will they take away from the experience? I think a lot of people say they feel trapped in the “Middlebury Bubble” and feel that they never really get to interact with any of the Vermonters in the area. I certainly felt that, and what I found in Habitat for Humanity was a way for me to break out of the bubble. I think folks should join our org because we do go out to meet people from the local community and, certainly in my case, make meaningful and lasting relationships with people from the area. Also, there’s just something wonderful and raw about the work that goes into building. Especially when I know that I went out and contributed to building someone’s home. Why did you first join Habitat For Humanity? I joined Habitat because of an assignment given by my First Year Seminar Professor, Matt Kimble. The class revolved around the topic of positive psychology and how we could use the research of psychologists to help enrich our own lives. One of our initial readings was on experience, and how some of the happiest experiences we have in our lifetime is when we join our local community in some sort of communal activity. Our professor asked that we join one student or local org and write a paper relating to our experience. When I joined Habitat, I just really liked what I did and then just kept doing it. Eventually, that led to me being offered a position on the board and now I help organize weekend builds. What has been your most memorable experience as a member of Habitat for Humanity? During one of my first builds in Cornwall, VT, me and another student, Mike Nunziante, were asked to paint the exterior of the house. First, we had to start from the second floor and then work our way down. The scaffolding we used seemed a little old, but, at least according to the foreman, was safe. To go down there was a lever that we actually had to kick so it could drop down. It took us some time to sum up the courage to eventually do it, but, once we finally moved down, it turned out to be less dramatic than we envisioned it to be. What have you learned, either about yourself or the world around you, as a member of Habitat for Humanity? Habitat builds usually pair people off, so typically people will find themselves working with the same partner all day. Needless to say, the conversations that then ensue while working on something are deep. I’ve learned that everyone has a story, and when someone is comfortable enough, they may just share it. I have always known that I am an active listener, but something Habitat has given me is a space where I am encouraged to also talk about myself and all the different facets of my life. I am from a working-class town east of Los Angeles. I come from immigrant parents, and am constantly amazed by what my parents have done to get me here into the states. Currently, I am a Molecular Biology and Biochemistry Major and an Art History Minor. I am also involved in the Ceramics club, where I enjoy making pottery for myself and friends.